So sayeth ThinkProgress's Ian Millhiser (or, more likely, the android who replaced him after he was sent to a secret Trump gulag). "Brett Kavanaugh said he would kill Roe v. Wade last week and almost no one noticed," read the headline of his September 9th piece. 1. In response to a question from Republican Texas Senator Ted Cruz during his confirmation hearing, Kavanaugh said that "Supreme Court precedent protects certain unenumerated rights so long as the rights are, as the Supreme Court said in the Glucksberg case, rooted in history and tradition," and that "I think all roads lead to the Glucksberg test as the test that the Supreme Court has settled on as the proper test." 2. 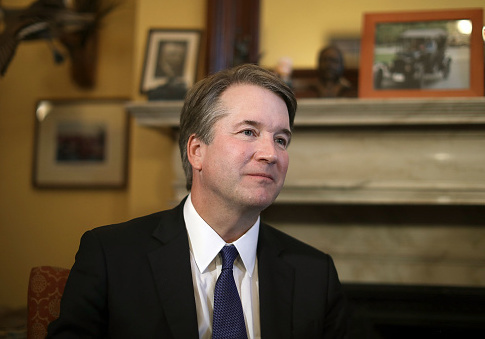 A year earlier, Kavanaugh said in a speech honoring the late Chief Justice William Rehnquist that "even a first-year law student could tell you that the Glucksberg approach to unenumerated rights was not consistent with the approach of the abortion cases such as Roe v. Wade in 1973 — as well as the 1992 decision reaffirming Roe, known as Planned Parenthood v. Casey." So if you take a year-old statement, combine it with what Kavanaugh said last week endorsing a 9-0 decision, it suggests that he might be inclined to overrule Roe, maybe? Let's be generous and grant that's true. It is still objectively false to say that "Brett Kavanaugh said he would kill Roe v. Wade last week." He just didn't say anything remotely close to that. Milhiser and his editors know what they're doing. You may or may not click on a headline that comes across your Facebook or Twitter feed reading "Brett Kavanaugh's testimony might not bode well for Roe v. Wade," or "Brett Kavanaugh's views on this Supreme Court precedent suggests hostility to Roe v. Wade." But Kavanaugh straight-up said he'd overturn Roe v. Wade??? Man, I gotta click on that. When the article was posted to Facebook, it got dinged by its new fact-checking program– unsurprising, given that it's an example of precisely the false, clickbaity headlines that the social media giant is trying to do away with. Facebook outsources fact-checks to a host of other outlets, including the Associated Press, Politifact, Snopes, The Washington Post. But the fact-check of the ThinkProgress piece was done by conservative outlet the Weekly Standard (who, I should note, has also performed several fact-checks of false claims from Donald Trump and other conservatives). "Before you share this content, you might want to know that there is additional reporting on this from The Weekly Standard," Facebook tells you if you go to share the story on your feed. That redirects you to a fact-check both of ThinkProgress's piece and MoveOn tweet saying Kavanaugh "stated he'd overturn" Roe v. Wade. "While ThinkProgress engages in an argument to suggest how Kavanaugh might vote in a Roe v. Wade redo, the article does not provide evidence that ‘Kavanaugh said he would kill Roe v. Wade,'" the piece reads. "Has Brett Kavanaugh ‘stated he’d overturn #Roe'? No." It would be an understatement to say ThinkProgress was not happy. "The Weekly Standard ‘fact checked' the piece and deemed it false. BUT THE FACT CHECK DOES NOT EVEN CONSIDER IAN'S ARGUMENT. IT TOTALLY IGNORES IT AND FOCUSES ON AN EMAIL THAT WAS NOT AT ALL THE POINT OF IAN'S PIECE," very calm ThinkProgress founder Judd Legum tweeted. Legum of course misses the fact that it is completely unnecessary to even consider Milhiser's argument. He said in the headline that Kavanaugh "said he would kill Roe v. Wade." Kavanaugh never said that, and there's no evidence given in the piece he said it. Case closed. It's sufficient to say, as the Weekly Standard does, that they searched for any evidence that Kavanaugh ever said he'd overturn Roe v. Wade, and came up empty. Milhiser himself responded in a piece headlined "Facebook censored ThinkProgress because the Weekly Standard told them to censor us." (Maybe not the headline to go with when you just got punished for a misleading headline, but I digress.) The case for why his headline wasn't actually false is an eye-opening exercise in doublespeak. "The Weekly Standard’s fact-check appears to hinge on the definition of the word ‘said,'" wrote a human being, presumably in earnest. Yes, really. The Clinton-allied outlet went on a diatribe on how their story was accurate depending on what the meaning of "said" is. According to Merriam-Webster’s dictionary, the verb "say" or "said" can mean to "indicate," "show," or "communicate" an idea. Our argument is that Kavanuagh indicated, showed, or communicated his intention to overrule Roe when he endorsed the Gluckberg test after saying that Gluckberg is inconsistent with Roe. Allow me to suggest that when you have to go to the dictionary to back up your claim someone "said" something, you've lost the argument. To spell out the obvious, "said" can mean "communicate" or "indicate" in circumstances where the speaker rather obviously intended to convey a certain message and that intention is beyond doubt. You might say that "Kavanaugh said he loves baseball" if he went on an extended rant on how much he loves baseball without saying "I love baseball." But Kavanaugh never, in a million years, said anything in the Senate hearing that indicated he wanted to kill Roe. That Kavanaugh "said" so was a subjective judgment. If that's the new standard, so be it. Then allow me to say that this week, ThinkProgress said, loudly and clearly for the world to hear, that they don't care about the truth. I suspect that statement can actually pass a fact-check. This entry was posted in Politics and tagged Brett Kavanaugh, ThinkProgress. Bookmark the permalink.